In our activity index, you will find all the Mr. Ráfaga matches currently in our database. Additionally, the most recent matches of Mr. Ráfaga are listed below. To see all the matches Mr. Ráfaga fought in a specific month, click the respective number in the index. 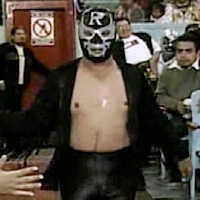 Espíritu Maligno, Siki Osama Jr. and Mr. Ráfaga defeated Tigre Rojo, El Legionario and Califa Jr.
Asturiano, Silver and Tigre Rojo defeated Espíritu Maligno, Mr. Ráfaga and Siki Osama Jr.
Black Tiger, Blue Center and Centella de Oro defeated Mr. Ráfaga, Saurón and Toro Bill Jr.